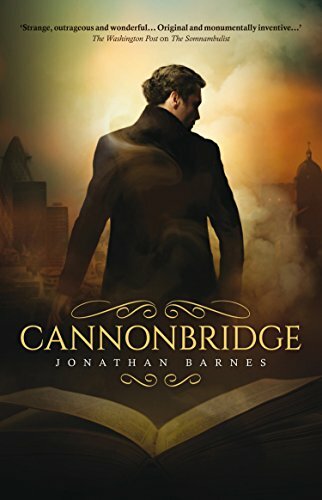 Cannonbridge by Jonathan Barnes (Solaris, Feb. 10th, 2015)-The past and the present collide to fantastic effect in Jonathan Barnes’s dark gothic fantasy. Matthew Cannonbridge is revered for his beloved Victorian stories, even above such literary greats as Dickens, Byron, Wilde, and many more. In fact, Cannonbridge has touched the lives of all of the Victorian literary greats in various ways, spanning over a century, which might go a ways in eclipsing the idea that he’s altogether…human. Cut to the near future, and enter Toby Judd, a scholar that is disillusioned by Cannonbridge’s fame, possibly having a bit to do with his wife leaving him for the author of a Cannonbridge biography. When he gives a lecture on his belief that Cannonbridge is a construct instead of a real person, his rather fevered rant is recorded and goes viral on YouTube, bringing him to the attention of some very powerful, and evil, people. With the help of a waitress who may be more than she seems, Toby must go on the run, and stay alive, but the shadowy people that follow him seem to be legion, and the truth about Cannonbridge may prove the existence of an evil beyond what Toby could ever have imagined. Good grief, this is good stuff. I’ve read The Somnambulist and The Domino Men and remember thinking that this is how London dark fantasy should be done. Well, this is how gothic SF horror should be done. Toby is a physically diminutive man set on a near impossible collision course with a very dangerous foe and the poor guy’s wife just left him, seemingly out of nowhere. He’s psychologically beaten down but he’s also a man with not much to lose. Sometimes those are the most dangerous people. It’s really a race against time, because the bicentenary celebration of one of Cannonbridge’s most famous works is coming up, and Toby suspects that it will usher in something terrible, and not of this world. The author seamlessly moves between the 1800s and the near future, and invokes a dark, dangerous, decadent London where the literati reigns and new ideas and enlightenment are feverishly sought. Add a very creepy killer for hire to the mix (in hot pursuit of Toby), along with a mysterious island, and even a nod to Jack the Ripper, and you’ve got a winner. This is a delight for literature lovers and SF fans alike, and its major theme is a timely one. I’m not going to give that away, because I think it would ruin it, but suffice it to say that it’s nicely done, and I’m all for social commentary when you give it an ingenious, and very creepy, twist, as Barnes does here. He writes beautifully, and doesn’t tie up everything with a neat bow at the end. Nope, he doesn’t let you off that easy. Toby is a hero to root for, with everyman appeal, and if you haven’t discovered the awesome that is Jonathan Barnes, here’s a perfect place to start.